The president kicked off a weekend at Mar-a-Lago with a speech at a fundraising dinner but few words about special counsel Robert Mueller. PALM BEACH, Florida – When the news finally broke that Robert Mueller had completed his investigation, President Donald Trump was cloistered in the safe space of his private club here, surrounded by senior aides and the diehard supporters who pay big bucks to catch a glimpse of him. As Washington melted down over the long-awaited news 1,000 miles away, the fierce Trump defenders here girded for an epic battle. “He seems to be able to deal with most of the stuff that most people can’t. I am convinced that he can weather anything he’s put through,” said Joyce Lewis Bass, a board member of the Boca Raton Regional Republican Club. On Friday night, just feet from where Trump and his family were having dinner, local Republicans were holding a fundraising dinner. The logo for the event: a five-dollar bill featuring a MAGA-hat clad Abraham Lincoln. Organizers had held out hope that Trump would make an appearance at the event, and White House officials initially signaled he wouldn’t attend, saying he planned to spend his night on Mar-a-Lago’s patio with First Lady Melania Trump, their son Barron, and Melania Trump’s parents. The president spoke to the cheering crowd for about two minutes, with the first lady standing beside him on stage, according to a video of his remarks obtained by POLITICO. He said nothing about the Mueller news. Instead, he thanked “the legendary Pam Bondi,” Florida’s former attorney general who was honored at the dinner, and marveled at the first lady’s poll numbers. The president also cracked a joke about the keynote speaker, Sen. Lindsey Graham of South Carolina. The dinner capped another whirlwind day for Trump. As they braced for the report throughout the day Friday, Trump and his team tried to convey an image of a president putting his head down and focusing on the job. Aides arranged a meeting with the leaders of five Caribbean countries, the president announced his pick to join the Federal Reserve and he bragged about the defeat of the Islamic State. But Trump quickly overshadowed those efforts, issuing a confusing tweet that implied he was undoing North Korea sanctions that his administration had just put in place. The tweet caught many in the White House by surprise and the administration later tried to clarify, insisting he was referring instead to not-yet-imposed sanctions. “So here is ISIS on Election Day. Here’s ISIS right now,” he said. The only problem: the graphic didn’t compare ISIS’s current territory to Election Day in 2016. According to photographs captured by reporters, it compared the territory to 2014, undercutting the president’s about turning things around immediately after taking office. Trump tried to project calm throughout the day, distancing himself from the image of a man about to suffer a political blow. On his arrival at the airport here, he delighted in the adoration of his supporters, signing a red “Make America Great Again” hat. 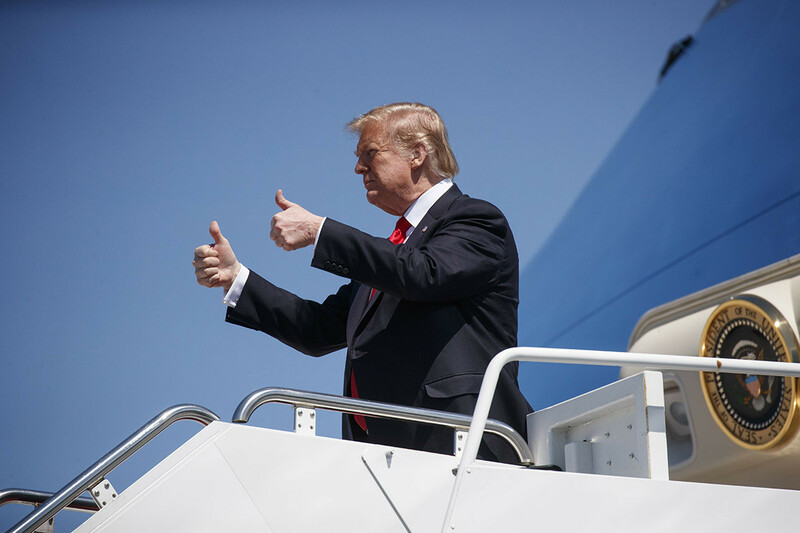 But there were more subtle signs that the White House — like all of Washington — had assumed crash position ahead of the transmittal of Mueller’s report to Attorney General Bill Barr, which happened at 5pm, shortly after a sudden blinding hailstorm tore through an already-anxious capital: White House counsel Pat Cipollone joined the president at Mar-a-Lago, according to a person familiar with the matter, as did Sanders, who doesn’t always travel with the president on weekend trips. But he didn’t mention Mueller for the rest of the day. Though the president is often eager to field reporters’ questions, he ignored journalists as he sat alongside the Caribbean leaders, under two gold and crystal chandeliers. For once, it seemed, Trump felt he had nothing more to say. He was content to wait. By late evening, he had resisted tweeting once about Mueller or Russia. Friday’s fundraising dinner was hosted by the Palm Beach County Republicans. Tickets for the fundraiser started at $375, with sponsorship packages going as high as $25,000. The mood at Mar-a-Lago Friday afternoon was low-key, despite the furor over the Mueller developments swirling in Washington. A nearby parking lot was packed with luxury cars, including a bright yellow Porsche and a chrome Rolls Royce. A woman in the parking lot sported a black fur coat in the nearly 75-degree weather. Mueller’s actual conclusions remain under lock and key at the Justice Department. But supporters here seemed unfazed by the report’s imminent disclosure. Marc Caputo and Anita Kumar contributed to this story.